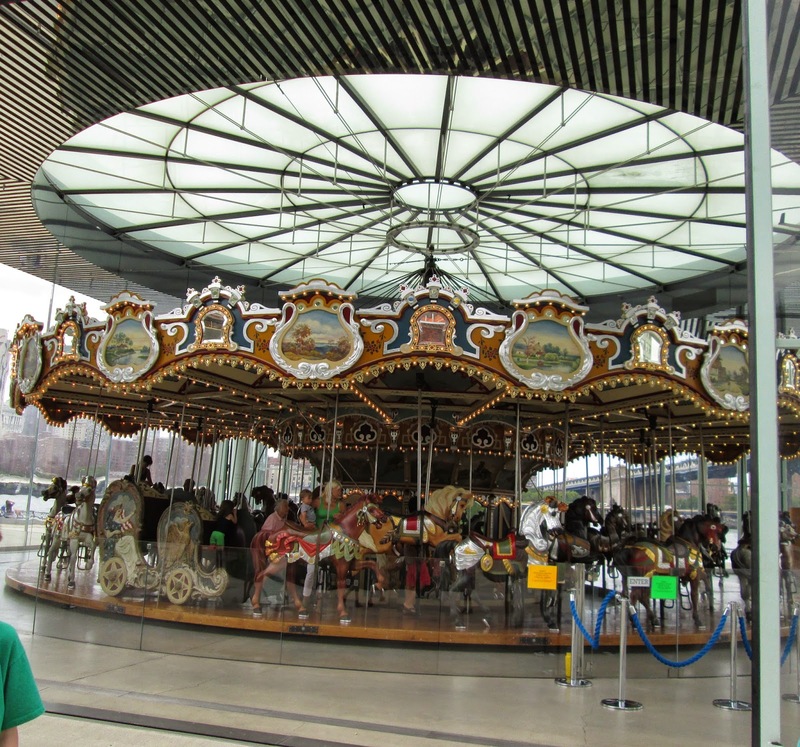 If you find yourself in NYC do make the trip to Brooklyn to visit Jane’s Carousel—a carousel built in 1922 by the Philadelphia Toboggan Company, originally installed in Youngstown, Ohio, and now at DUMBO Park, Brooklyn. 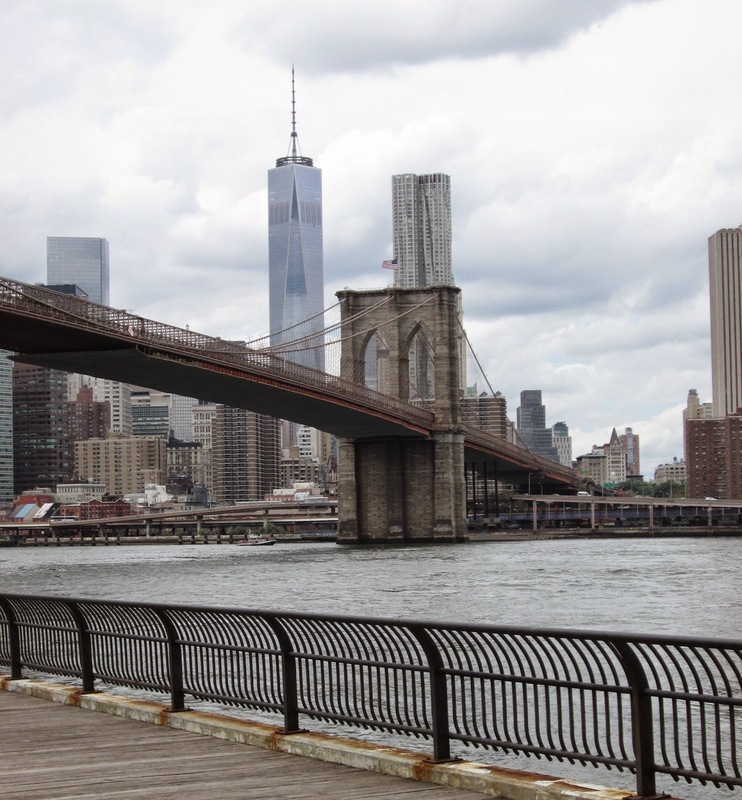 DUMBO, in case you don’t know, stands for Down Under the Manhattan Bridge Overpass. 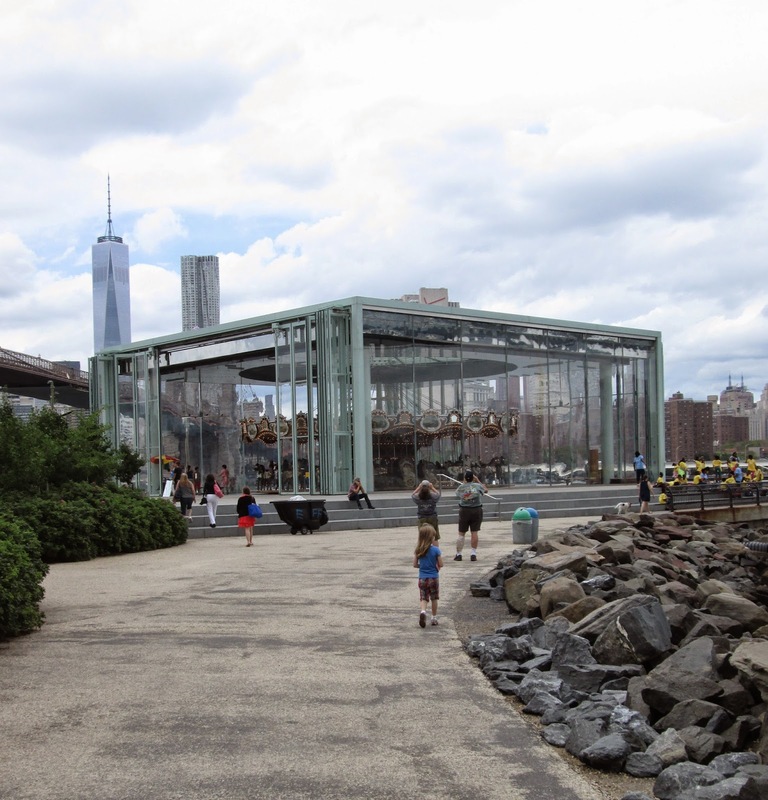 The carousel, lovingly restored to its full glory, is ensconced between both the Brooklyn and Manhattan Bridges and is housed in a beautiful glass pavilion by Pritzker Prize-winning French architect Jean Nouvel, making it look like a glittering jewel on the edge of the East River. On the path to the carousel. 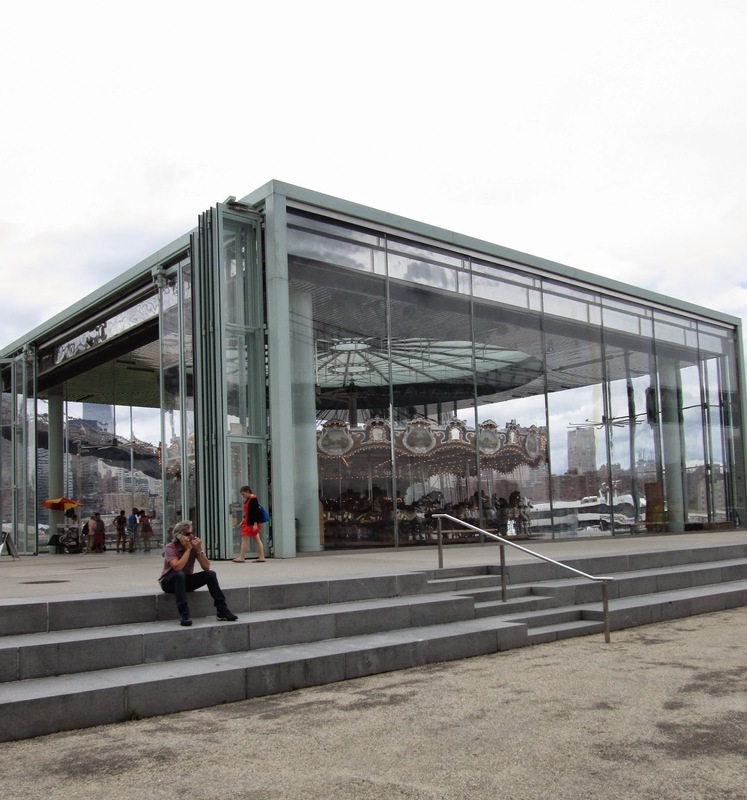 Jean Nouvel designed this amazing pavilion for the carousel. Lovely and filled with light. For the time being, Jane’s Carousel (and the surrounding area) is full of gorgeous charm, and gives you the most glorious views of Manhattan you could ever hope for. I highly recommend it! Great views just steps from the carousel, though 1 World Trade is a hideous piece of architecture. You get a wonderful view of the city as you ride! A view of Manhattan Bridge, one of my favorite bridges in NYC. There is beauty everywhere you look on this carousel. Amazing details and gorgeous color! Only two dollars to ride! Even the tickets are pretty. I love this gorgeous horse. Every time I see a carousel, I think back to that scene from Strangers on a Train. I'm so glad this carousel is being kept up. I love it! Now I want to go...1 World Trade? Is that the new building? It does look unsightly and not really befitting New York City. Who is the carousel named for? I love carousels. Thank you for sharing this one with us. It's a beauty! 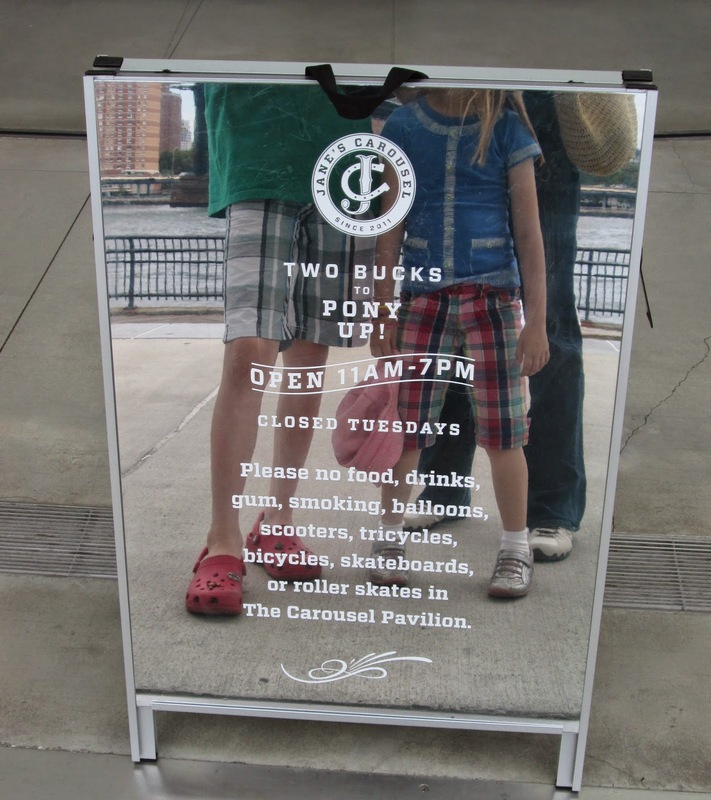 Will have to go to DUMBO to see this beautiful carousel. don't call it that anymore.